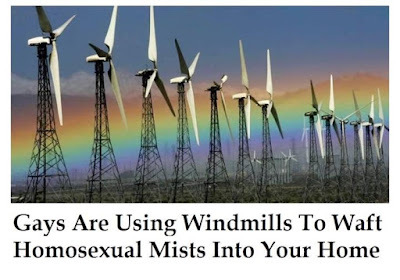 Now that their raving lunatic leader Donald Trump has gone and claimed that windmills cause cancer, it's only a matter of time before his fellow inmates in Republican Jesusville start attributing all sorts of things to "evil windmills." Wind power is the new "Great Satan" of the sick Republican Hive Mind. I can see Mike Pence and Lindsey Graham suffering great pangs of inner conflict. I can see Alex Jones' Info Wars and "FOX News" doing hours and hours on the topic. Senile Lou Dobbs will shake his fist at the winds and blame "the gays" for a destructive F4 tornado in Oklahoma. Pat Robertson, with his history of blaming gay people for all of society's ills, will be a special guest on Hannity, replacing fellow asylum denizen Rudy Giuliani. Maybe even both loons will appear together with Sean a couple of nights per week. Wouldn't that be special? FOX And Fiends will be all in just like they were with that fake story about the Los Angeles Police zooming around LA with jet packs on their backs, Obama being born in Kenya, etc. Tucker Carlson will start sweating profusely and call upon a contractor to seal all of his windows shut permanently. Then, one night, live on the air, he'll start panicking and screaming about the breeze of the air conditioning in the TV studio. The screen will go blank black and then be replaced by a rainbow test pattern accompanied by the steady hum of wind turbines, thus proving the conspiracy was true all along, at least in the minds of these sickos. And yet the democraps won't take over from these mental defectives. They are in their own way crippled mentally, for their object of worship resides with the American Pharisees and their "we're all capitalists here" values. Who cares if Flint has foul water as long as those contributions from Wall St. keep coming in. 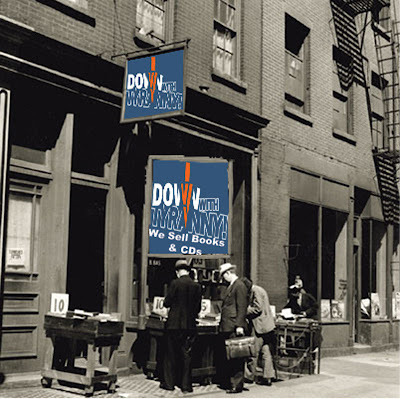 6:43, when the windmill corporations start donating a billion per cycle, the democraps will defend wind power. not until then. 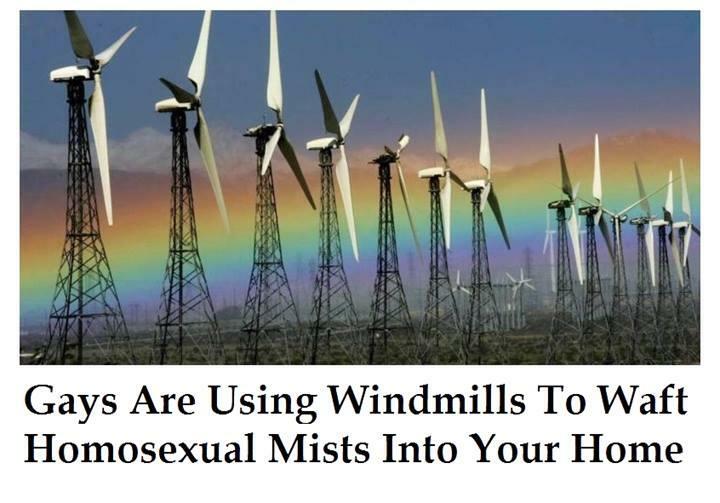 also, anyone who is so fearful of 'gay mists' that they will believe this ... I got news for you'se... you're already gay. embrace it. there's nothing wrong with being gay at all.